You probably haven’t heard of Bizarro Fiction. I know I hadn’t. As an established genre, Bizarro is a relatively new concept, though the form and ideas have been around for a long time. As the official Bizarro website states, ‘Bizarro, simply put, is the genre of the weird.’ Combining logic of the absurd with twisted, occasionally pornographic, and always macabre themes, it brings to mind the writings of Christopher Moore, Franz Kafka, and even Lewis Carroll, just to name a few. Since it is such a new genre, Bizarro is always looking to further the art form and release new talent on an unsuspecting world. 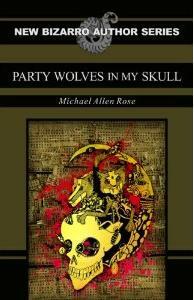 One of the eight books released this year by the New Bizarro Author Series, Party Wolves in My Skull by Michael Allen Rose is a shining example of what it means to be shelved in the Bizarro section.